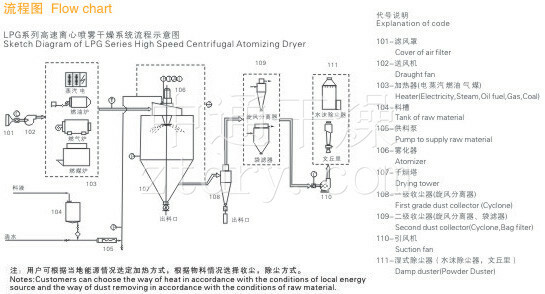 LPG Series High Speed Centrifugal Spray Dryer - Changzhou Fushite drying Engineering Co., Ltd. The pressure spray drying granulator uses a pressure atomizer to atomize a solution or a slurry material into fine droplets by means of the pressure of a diaphragm pump, so that the surface area is significantly increased, and is quickly dried by thorough heat exchange with hot air ( A few seconds to tens of seconds) to obtain a device for powder or small particle products. ●The drying speed is fast. After the atomization of the liquid, the surface area is greatly increased. In the hot air flow, 95%-98% of the water is evaporated instantaneously. 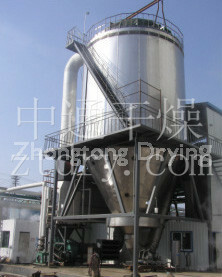 The drying time is only a few seconds, which is especially suitable for the heat-sensitive material drying. 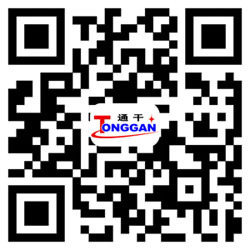 ●The finished product has good uniformity, fluidity and solubility, high purity and good quality. 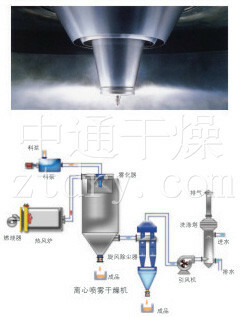 ●The production process is simplified and the operation control is convenient. For liquids with a moisture content of 40-60% (up to 90% of special materials), the liquid can be dried into a powder product at one time. After drying, no pulverization and screening are required, the production process is reduced, and the purity of the finished product is improved. The particle size, bulk density and moisture of the product can be adjusted within a certain range by changing the operating conditions, and the control and management are very convenient.